Can you believe that it’s the last day of 2017? With a new baby in the house, it’s been an exhausting whirlwind of fun and adjustments. Do you have any idea how hard it can be to keep your house neat when there’s a little one tugging at your heartstrings? After ten months of trial and error, I feel like I’ve finally gotten a simple system down that works for our family. This system is far from perfect and my house definitely doesn’t qualify for a magazine spread, but it is a simple system that anyone can adapt and fine tune to meet their own needs. When Baby Fox was first born, keeping my house neat was the last thing on my mind. I was focused on keeping a tiny baby alive and fitting in a little self care to help with the overwhelm that motherhood can be. My mom stayed with us for the first month and that was a huge help, but after our revolving door of visitors stopped, I suddenly had a household to manage all by myself and I found the time management side of things to be a bit trickier with an infant demanding a large chunk of my time. I’m the type of person that believes your surroundings affect your mood. Let’s just say this theory was put to the test in 2017 and I definitely felt my best (and was more productive) when my surroundings were calm and (somewhat) orderly. It took a few months of trial and error but I eventually found a few things to help me keep up with my house. As I’ve been reflecting on 2017, I’ve realized that these four tips could help others in 2018, which is why I’m sharing them with you today. 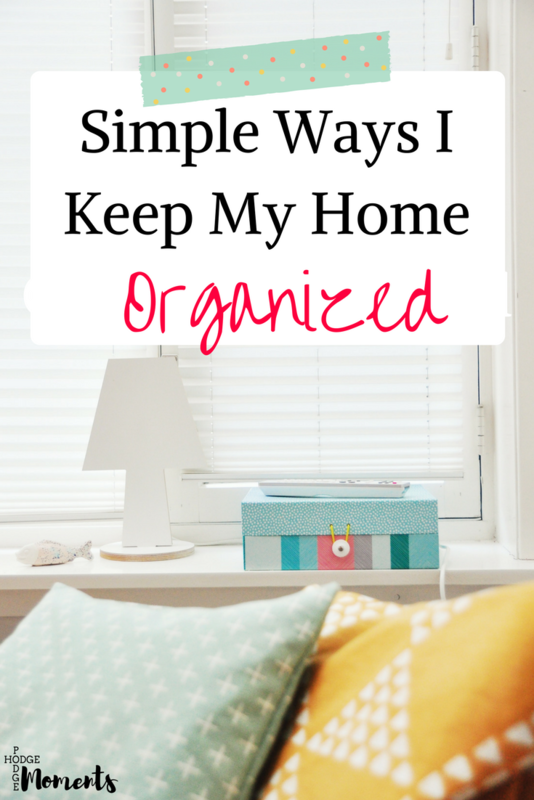 This is the secret weapon of keeping your house organized. I like to do daily pick ups throughout the day to make sure everything is in order. This includes picking up toys when Baby Fox takes a nap. Another quick pick up item that I do is putting the dishes in the dishwasher after most meals. These little pick ups help me when I get to the end of the day and do my final pick up around the house, returning items to their respective spots in the house. 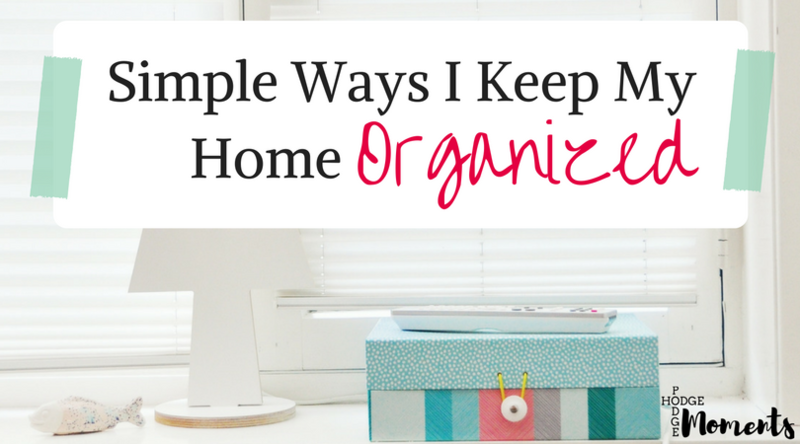 This brings me to my next secret weapon to keeping a house neat and organized. This brings me to the next important step of keeping your house organized. Everything should have a place of its own. When things don’t have a designated place, then they tend to get left around the house in any temporary spot they can find. When they have a home, they are much more likely to make it there during the day or at the very least during the nightly pick up. I don’t go crazy with labels, but you could even label things if it’ll help the other members of your household. This is something that has helped me a lot! When I go out shopping, I try to go out with a list and a purpose. Lists are helpful for your regular errands such as grocery stores and picking up those odd and ends you need. Having a purpose when you’re shopping can help keep you on track and away from those impulse buys. I’ve noticed in my many decluttering sprees that the impulse buys are typically the ones that end up in the donate or sell pile. I try to really think through my purchases to prevent unnecessary items from entering our home. I wish I could take credit for the phrase above, but I can’t. It’s actually a phrase that Nora Spaulding used in one of our conversations about organizing. I liked it so much that I simply had to include it in this post. I tend to revisit my organization system at least once a year. 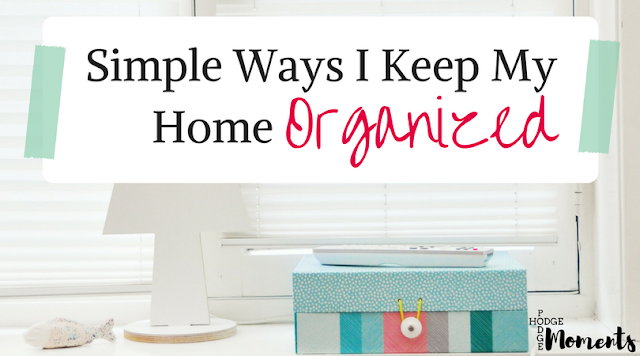 During this time, I reevaluate, declutter, and improve my organization systems as needed. After several moves and years of using this method, I’ve decided to share it all in a free challenge that starts January 7. In the Room by Room Challenge, I’ll walk you through my system for decluttering and organizing the house one room at a time. In fact, I’ll be working through my rooms at the same time as you. This challenge is designed to help women at all levels of organization. Whether your home is well organized or looks like a tornado recently came through it, you’ll be able to find things in this challenge that will help you out. I’ve also lined up guest speakers on special topics to help take you beyond the rooms of your house. I can’t wait to share even more of my tips and tricks with you! The fun all starts January 7! I’m curious – which room in your house currently needs the most organization help? I’d love to hear about it in the comments below! I love that mantra! I would say mine is pretty close in nature as well. There are times it’s perfect and then there are times it falls apart because life happens. Great tips! The daily (or multiple-times-daily on some days!) pick up is crucial. With 3 kids our house turns into a disaster very quickly. The pick up is such a crucial step for keeping the house under control!